Spring is in the air and baby animals abound in our State Parks. Look and listen for some of these young critters in our parks. Remember, it is best to watch them from a distance so you do not scare the young animal or its parent. If you see a young animal that looks like it is abandoned, please leave it be. It is most likely fine on its own or has a parent close by and waiting for you to back away. It is fun to explore and watch, but don’t stay in one spot too long so that the animals can go back to their daily activities. A class gets a close-up look at a young box turtle at Clay Pit Ponds State Park Preserve. The turtle was handled briefly and then released where it was found. If you find turtles crossing the road or trail, you can move them to safety by putting them on the side where they were headed. A pair of young raccoons peek out from behind a tree at Fort Niagara State Park. A red fox vixen keeps a watchful eye over a pair of kits at Letchworth State Park. Warm weather brings the honey bees back into action. Here, a drone honey bee (at left) is hatching from the hive at the Taconic Outdoor Education Center. Canada geese and goslings at Jones Beach State Park. Adult geese can be pretty aggressive about protecting their babies, so watch quietly from a distance. The goslings can be a lot of fun to watch as they scurry about. Mother mallard and her many ducklings. A white-tailed deer fawn hiding in the brush at Letchworth State Park. The mother is close by, watching you and waiting for you to move on. You have to look hard and move quietly to get a chance to see these youngsters in the woods. Red efts are the young stage of the aquatic eastern newt (Notophthalmus viridescens). You can hold this one gently, but keep it close to the ground as it will run right out of your hand. This one was seem at John Boyd Thacher State Park. Black-capped chickadees nest in tree cavities or will use birdboxes as seen here. You might see Eastern cottontails in your back yard, local park or in the campground or picnic area in many of the state parks. Bald eaglet are really big baby birds. This one has been banded by wildlife biologists. The blue and silver leg bands help identify the bird when it is seen elsewhere over the course of its adult life. Young killdeer on the run at Allegany State Park. They have a really loud call and may be seen in open areas like lawns and parking lots! Killdeer are precocial birds, meaning they leave the nest shortly after they are hatched. Eastern phoebe nestlings getting a little too big for their nest. Time to try out those wings. Young snapping turtle covered in duck weed from its pond. Remember that bigger snapping turtles bite, so keep your distance. A very tiny wood frog, identifiable by the dark mask on its face. It’s ok to hold them gently for a bit, but let them go so they can grow up in their home in the woods. A young American woodcock hides in the underbrush, so well camouflaged and thus seldom seen. A young dusky salamander found in a wet log at Allegany State Park. It is great to explore and find young animals. Keeping hands off can keep them safe and allow you to observe their behavior in their natural habitat. Take time this spring to enjoy our State Parks little critters! Thank you to all staff who contributed to this post. New York State is home to a variety of animals! There are nearly 100 mammal species, 375 bird species, and over 70 species of reptiles and amphibians found in New York. While we try our best to understand these animals, sometimes myths spread about them that may not be true. Can turtles come out of their shells? Do toads give you warts? These common animal myths stem from folklore, old sayings, misunderstandings, and more, but we can do our best to separate fact from fiction. Let’s take a look at some top myths about a few animals found in New York State Parks! No, bats are not blind! The bats found in New York are part of a group called microbats, which do rely heavily on echolocation (the location of objects by reflected sound) to navigate and find insect prey. Scientists who have examined the eyes of these bats have determined that they have some night vision as well as limited daylight vision. Some species even have ultraviolet (UV) vision. Though not found in New York, megabats—the fruit-eaters—rely primarily on vision and smell, rather than echolocation. Overall, vision is important to help bats avoid predators and find food and shelter. Fun fact: While several animals can glide (like flying squirrels), bats are the only mammals known in the world that are capable of true and sustained flight! Will touching a toad give you warts? Good news for all of us that grew up catching frogs and toads. No, touching a toad will not give you warts! Warts are actually caused by a virus that is spread between people. This myth probably began because of the bumpy skin on a toad’s back. There are two bumps to be careful of though; behind the eyes of toads are two large areas called parotoid glands. As a defense mechanism, these glands produce a toxin that causes irritation to a predator’s mouth. So if you do catch a toad, it is still a good idea to wash your hands afterwards. Can porcupines shoot their quills? No, a porcupine cannot shoot its quills! First, let’s take a look at what a quill is. A quill is a very stiff, hollow hair that can be found mixed in with the softer hair of a porcupine. When threatened, a porcupine’s quills may stand up to scare away the threat, but they cannot be shot from the porcupine’s body. There must be direct contact with the quills for them to dislodge, but even the lightest touch can be enough to dislodge a quill or two. Best to keep our distance around porcupines! Fun fact: The North American porcupine has around 30,000 quills! No, there’s no way a turtle can come out of its shell! A turtle’s upper shell, called the carapace, is partly made of bone from the turtle’s rib cage and is actually fused to the turtle’s backbone. The lower shell is called the plastron and the two shells are joined by a bony bridge. The shell is part of the body and grows along with the turtle, which is different from crabs and lobsters that must molt or shed their exoskeleton. And to address another common animal misunderstanding, turtles are able to feel when something touches their shells, due to the presence of nerve endings in the shell. Do all bees die after they sting you? No, it depends on the species! Honey bees, for example, have barbs (hooks) on their stinger that can stick into the skin of the target and prevent the stinger from being pulled out by the bee. If the barbs are stuck in the target’s skin, the stinger is torn away from the bee’s body when it tries to fly away and the honey bee dies. Other bee and wasp species, including bumblebees, yellowjackets, and paper wasps, have stingers with small barbs, enabling them to sting multiple times. On May 3, 2014, over a hundred volunteers with scientific backgrounds gathered at Minnewaska State Park Preserve in Ulster County and Clark Reservation State Park in Onondaga county for two concurrent Bioblitzes, 24-hour inventories of the park’s biodiversity. Our objectives were to search the park for as many rare species and natural communities in the park as we could find. This was a collaborative effort between NY Natural Heritage Program (NYNHP), State Parks, and Parks & Trails New York. 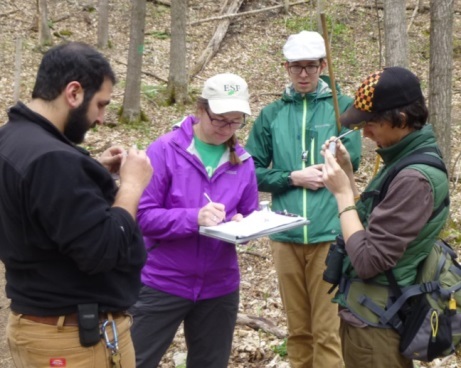 Participants included biologists with various specialties and affiliations including NYS DEC, NatureServe, Syracuse University, SUNY-ESF, Mohonk Preserve, U.S. Geological Survey, and the Student Conservation Association. At least 9 different organizations were represented. The main survey period was between 9am and 5pm on May 3rd, but some intrepid volunteers stayed through the night to look for nocturnal animals, while others arose on May 4th between 5am and 11am to identify spring migratory birds. In both parks, small teams sought out rare species and high biodiversity areas. The weather was overcast and cool on May 3rd, which made some of the surveys particularly difficult. At Minnewaska State Park, we were able to document approximately 262 plants, animals, and fungi, as well as 7 of the NYNHP significant natural communities. The summary of our findings includes at least 100 plants and 150 animal species: 89 birds, 6 fish, 16 herps (amphibians and reptiles), 16 mammals, and 23 invertebrates. The species included cool mammals like the American mink (Neovison vison), shy amphibians like the northern dusky salamander (Desmognathus fuscus), delicate insects like the spring azure (Celastrina ladon), and steadfast trees like the American chestnut (Castanea dentata). At Clark Reservation, we documented over 372 different species of plants, animals, and fungi and updated records for the 4 high-quality natural communities known in the park. The tally includes 193 species of plants (including lichens) and 96 species of animals, including 6 mammals, 7 herps, 46 birds, 4 fish, and 116 invertebrates. Of the many invertebrates identified, some of the largest groups were beetles (18), millipedes (10), caddisflies (10), and snails (6). The list of species included some entertaining names, such as bugle sprite (a snail), poverty grass, tortured tortella moss and seductive entodon moss. The Bioblitz proved to be an invaluable opportunity to get experts out in the park cataloging groups of species, like mosses and snails, which are often overlooked in typical biological inventories. Due to the timing of the Bioblitz to coincide with I Love My Parks Day on May 3rd, our bird surveys included both passing migrants and potential park residents. Whip-poor-wills (Caprimulgus vociferous), a species of special concern, were sighted in several locations at Minnewaska, and based on last year’s NYNHP surveys, they are known to nest in the park. At Clark, the highlights were osprey (Pandion haliaetus) and sharp-shinned hawk (Accipiter striatus), both of which are species of special concern in New York. 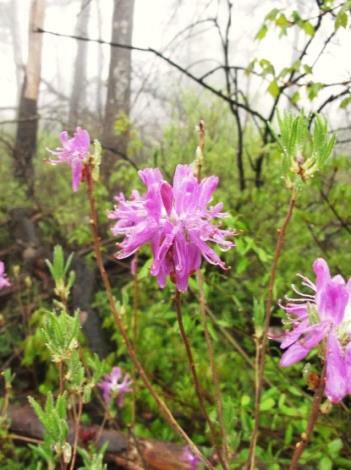 The bioblitz was an extension of the long-standing partnership between NYNHP and State Parks to document rare species and natural communities in New York State Parks. Scientists found a wealth of biodiversity and enjoyed collaborating across organizations and areas of expertise in a beautiful natural setting. We hope to continue these valuable efforts to bring experts together to share knowledge, contribute to our understanding of the biota in New York State Parks, and to encourage further opportunities for park staff and the public to learn more about the special features in parks. 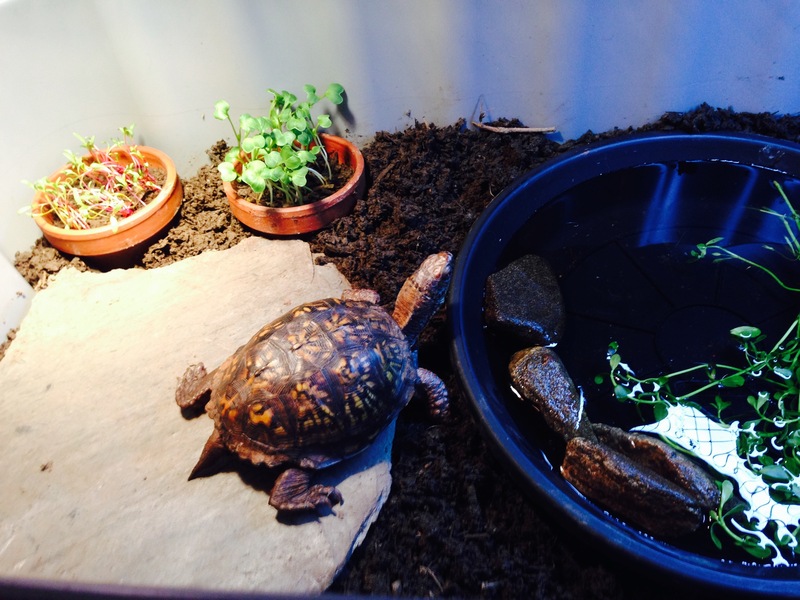 There’s a new critter at the Moreau Lakes Nature Center in Saratoga County – Daryle the eastern box turtle! For now, Daryle is staying behind the scenes as he gets used to his new home and lifestyle, but this summer he will star in educational programming out of the Nature Center. Box turtles are named for the special, hinged plastron that allow these turtles to close their shell almost completely. Box turtles live in open woodlands, pastures, and marshy meadows. They are often found near streams and ponds, where they like to enter the shallow water (although they are not aquatic). Daryle found his way to Moreau Lakes through Mid-Atlantic Turtle and Tortoise Society (MATTS). MATTS is dedicated to protecting habitat for turtles and tortoises and educating the public on proper care for pet turtles and tortoises. Daryle was attacked by a dog, and his subsequent injuries meant that he would never be able to close up his shell again. He would not have been able to survive in the wild, and so he was relocated to the nature center. However, Daryle won’t be lonely at Moreau – another turtle from MATTS rescue is already resident at the nature center. 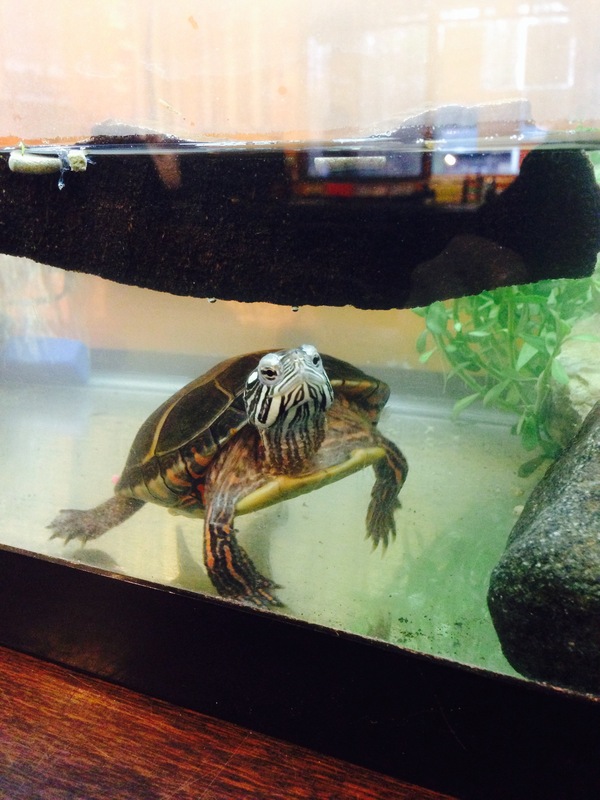 Berlin, the painted turtle, was an abandoned pet who has also found a new home at Moreau Lakes. The painted turtle is one of the most common turtle species in North America. In fact, it’s the only turtle that naturally occurs across the whole continent. They are often seen basking in groups on logs in the water and along the shore. They are omnivores, dining on plants, slugs, snails, insects, algae, as well as carrion and small fish. 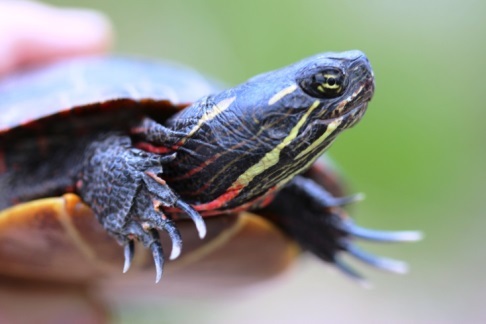 Painted turtles and box turtles are cute, but don’t take one home! Capturing native NY species as pets is illegal. Fortunately, the Moreau Lakes Nature Center has educated, caring staff that will make sure these unreleasable turtles live in comfort the rest of their days.